Are you looking to add a new room to your home? If so, have you utilized the entire square footage of you home? Why pay for expensive additions when you could make the best use of space that already exists? 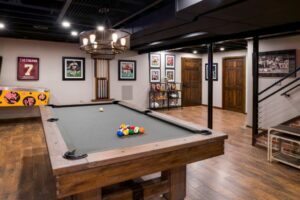 Many homeowners who determine they need more space to create entertainment centers, gyms, game rooms or a home office fail to consider their basements as a viable option. 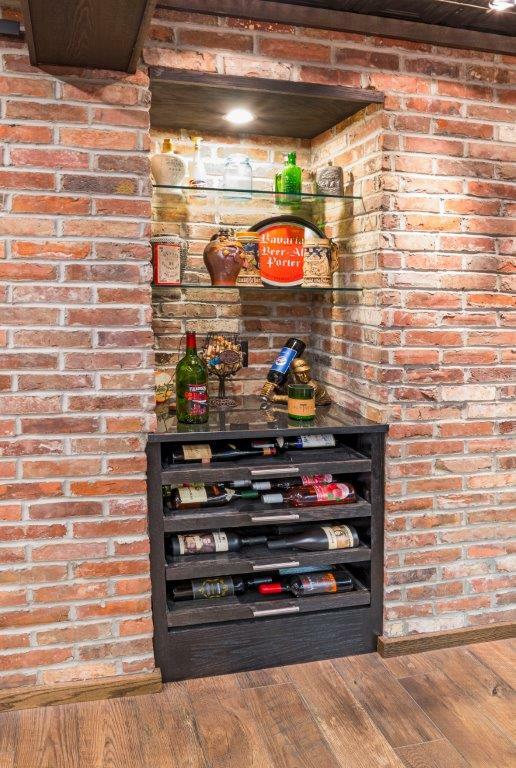 Most homeowners use their sizable basements for little more than a junk room or storage area. Sure basements tend to be more damp and darker than other areas of the home. That should not deter you from considering customizing your basement to add value and livability to your home. 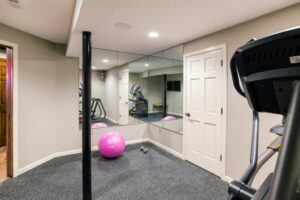 While basement renovations require some specific tactics to avoid mold and mildew from growing, if you work with an experienced professional design expert you could actually improve your home’s energy efficiency! 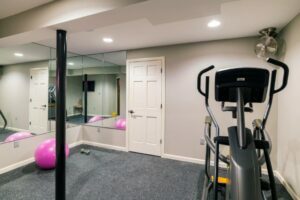 Unfinished basements are an energy drain because they lack the proper insulation and often siphon off the heat or air conditioning from the living areas of the home. Once properly renovated, a basement can help maintain moderate temperatures in your home by reducing leaks. 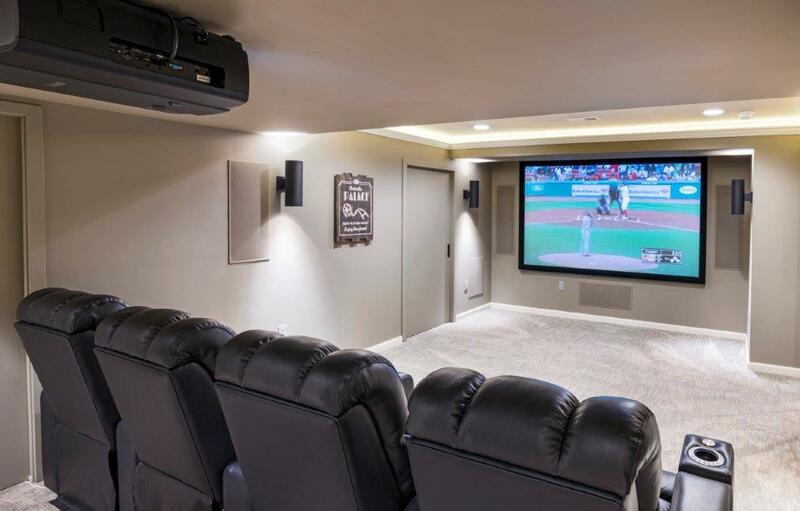 The fantastic acoustics of underground space makes a basement a great space for an entertainment center. Many homeowners choose to combine a number of options when committing to a basement renovation. 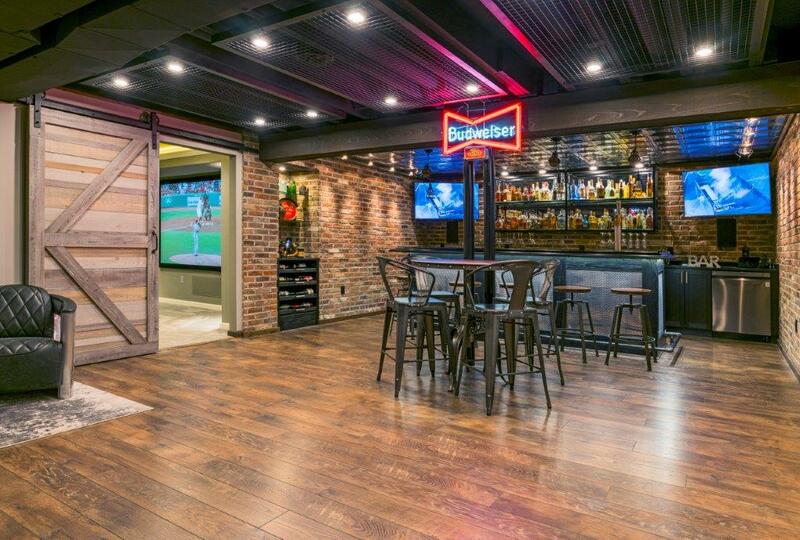 At DiSabatino Landscaping & Design, we have taken our outdoor design expertise indoors to expertly finish and utilize every inch of basement space in order to create inviting and unique custom basement renovations for our happy clientele. 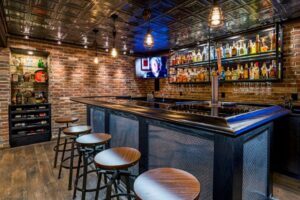 Check out the beautiful brickwork, inventive ceiling with dark ceiling tiles with inset lighting and gorgeous wood flooring. 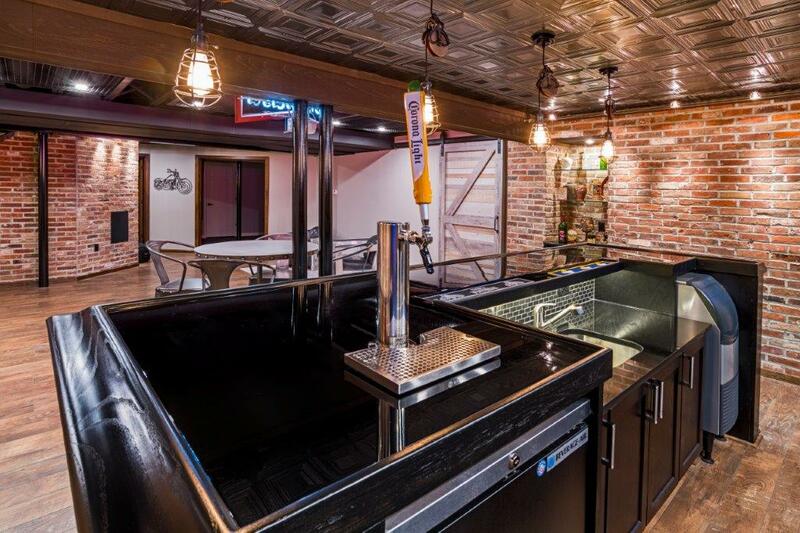 Make note of the flow of space from the custom bar to the game room to the entertainment center. 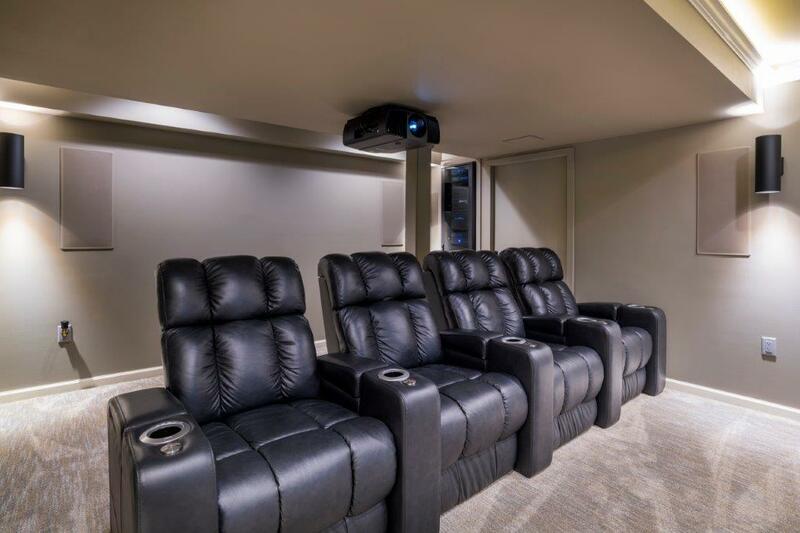 Imagine how your guests will be at ease and duly impressed when you invite them over for happy hour, game night or to watch a sports event in your state-of-the-art theater room. 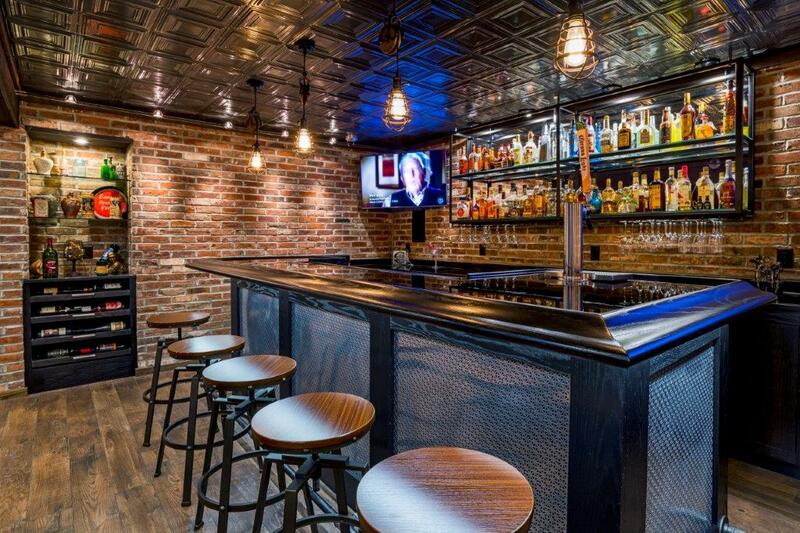 A fully customized basement renovation can make entertaining easy peasy! 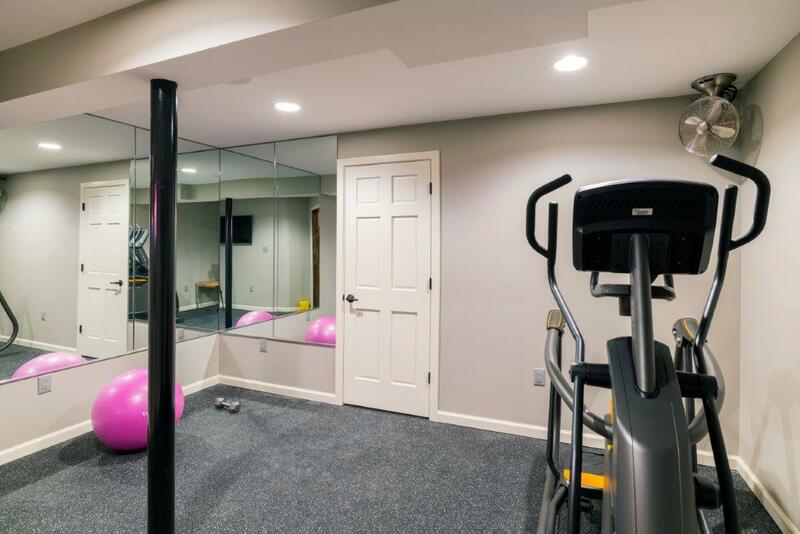 Whether it is a home office, game room, entertainment center or home gym, we can create a comfortable living area where your family will love spending time! Transform your unfinished or previously finished basement into a healthier, comfortable living area in no time! 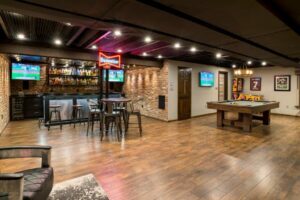 Check out our finished basement pictures for great examples and basement remodeling ideas! And when you’re ready, contact us for a free basement finishing consultation and quote. If you’re interested in talking with one our design experts regarding a custom basement renovation, call us at 302-764-0408 – email us at reception@disabatinoinc.com or fill out the form on our architectural design page. Posted in basement remodeling, basement renovations, entertainment centers, hardscaping design and tagged custom bar design, entertainment center, game room, home gym, home office on September 25, 2018 by Denise Bernstein.